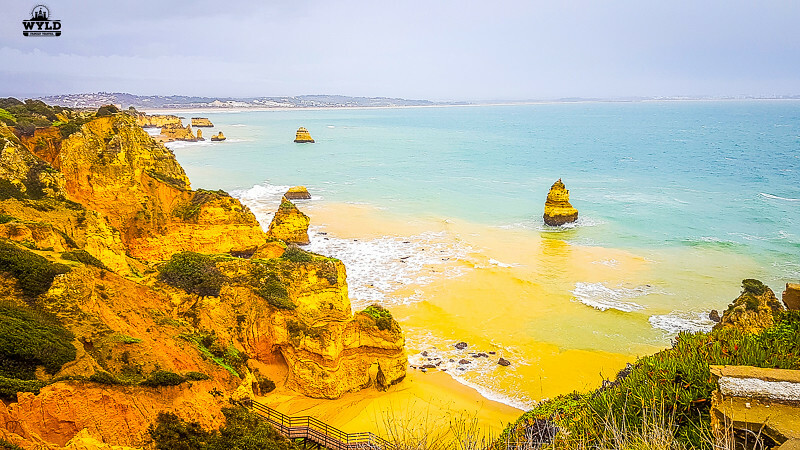 The Algarve region of Southern Portugal is famous for its warm weather and its beaches. The Algarve beaches are amazing and in the summer tourists flock to the Algarve beaches for fun in the sun. Towns like Albufeira, Sagres, Faro beach and Lagos explode with tourists. 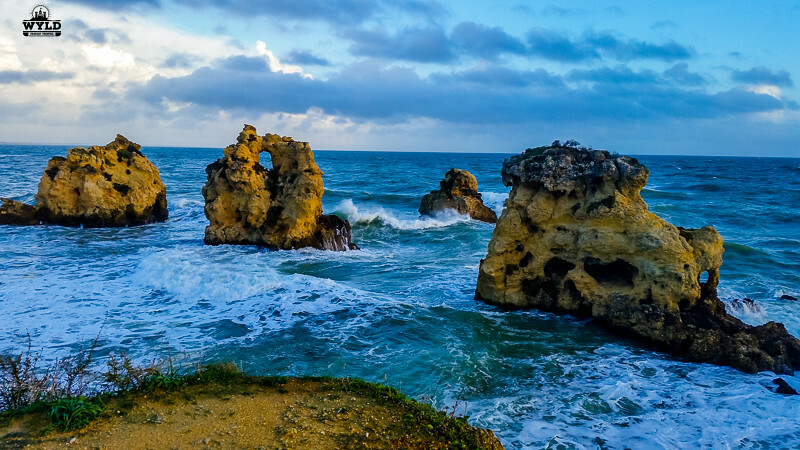 We headed to the Algarve in winter, not for swimming, just to explore this region when it was not overflowing with tourists and we got to see a beautiful side of the towns that may be missed during peak times. We stayed at Albufeira which has a bad reputation among the Portuguese we spoke to. They don’t like the town, they don’t like that it’s set up for tourists and they especially don’t like that it is very Un-Portuguese. Albufeira hop on hop off bus. Explore the seaside town of Albufeira at your own pace on a convenient hop-on, hop off bus tour. Take in the sights and don’t miss a thing with our open-top double-decker bus. Stop in the Old Town, see Fisherman’s Beach and get a glimpse of the castle. 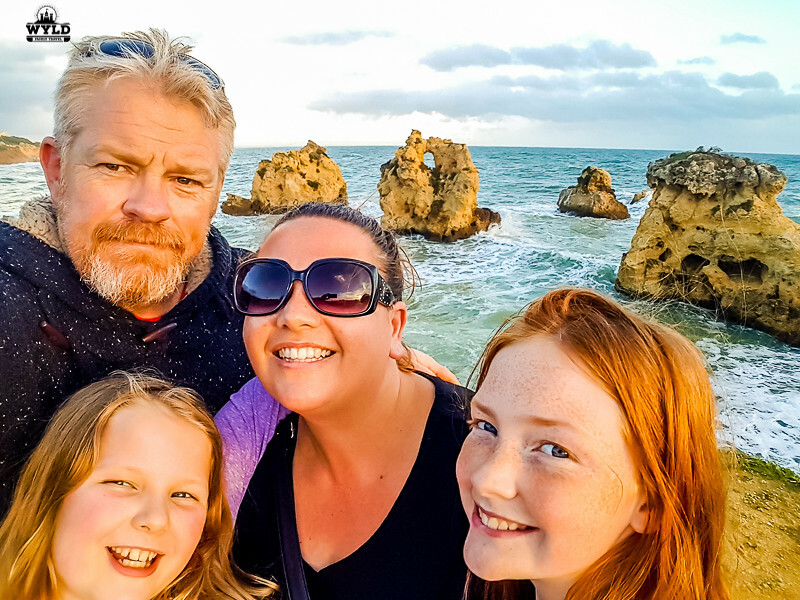 In our time and between torrential rainstorms that lashed the Algarve for the 4 days that we were there we set out to visit 2 of the best beaches in the Algarve. You know the ones, you would have seen them in pictures, articles that publicize the Algarve. We headed out of town in our hire car up the coast. I can tell you they were both well worth the drive. 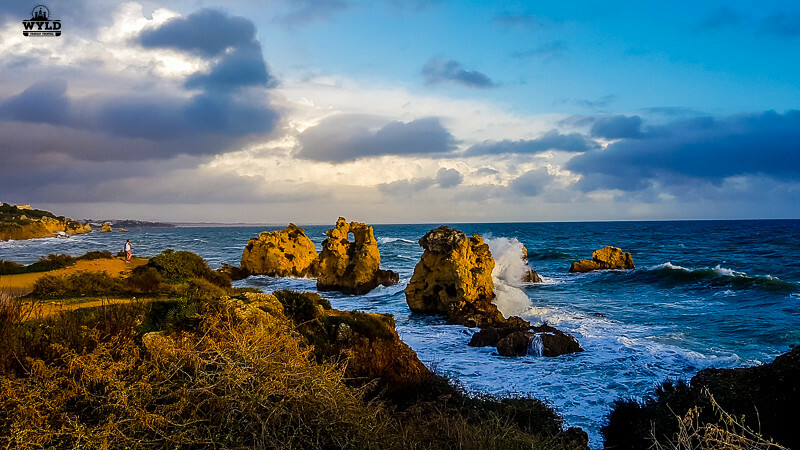 Praia Dos Arrifes is located 2.4 miles (3.9 km) by road to the west of Albufeira Old Town centre and is 29.6 miles (47.6 km) west of the region’s capital of Faro. To reach the sandy beach part you must descend down a set of wooden steps from the parking area. People with disabilities or mobility issues will certainly find this difficult as the descent is very steep and narrow. When we were there in the winter there was a bar and restaurant that would be a fantastic place to stop in the Portuguese summer for a drink and the view. It was so close to the water we don’t know how it has not been washed into it. You would definitely feel the sea spray enjoying a drink on the deck! A notice at the establishment said it was closed in the winter. Apparently, during the summer the beach is patrolled by lifeguards which make it brilliant for families. The car parking is a lottery at best with no real organised car parking. There is some adjacent land that people can park. We actually tried twice to have a look at this beach. The first time, we got out of the car and a few steps away when the sky opened and we were drenched within seconds. We had to make our way back to the hotel to change and thought we had missed our chance. Later that day we made our way back out and we were so pleased that we did. This was a great Algarve beach for kids! Do you think this looks like one the best beaches in Algarve Portugal? Our next beach was Praia do Camilo just out of Lagos. Lagos is another of the Algarve’s main town towns for tourists. You will find attractions, restaurants and accommodation in Lagos. The beach is accessed down 224 stairs, Willow counted them down and back up just to be sure. Let me tell you the trip down is amazing. The chance for pictures is on every step. The trip back to the top is a gut-busting cardio workout for all and the legs are nearly on fire by the time you reach the top! Praia Do Camilo is actually two beaches. You enter the first beach off the steps and you can access the second beach through a small tunnel carved into the rock. Much like Praia Dos Arrives, there is no access for the disabled. Again it was one of the best beaches in the Algarve for us! The day we went we had the beach to ourselves as it had been raining and was a cold, windy day. There are toilet and shower facilities at the top if the hill along with a popular restaurant with another fantastic view. They tell us that in summer you need to get here early to secure a spot on this amazing stretch of sand. One thing we learnt the hard way at this beach is that the red ‘sand’ is actually dirt washed off the surrounding cliffs and it is sticky. Marley was the first down the steps and proceeded to step in it. 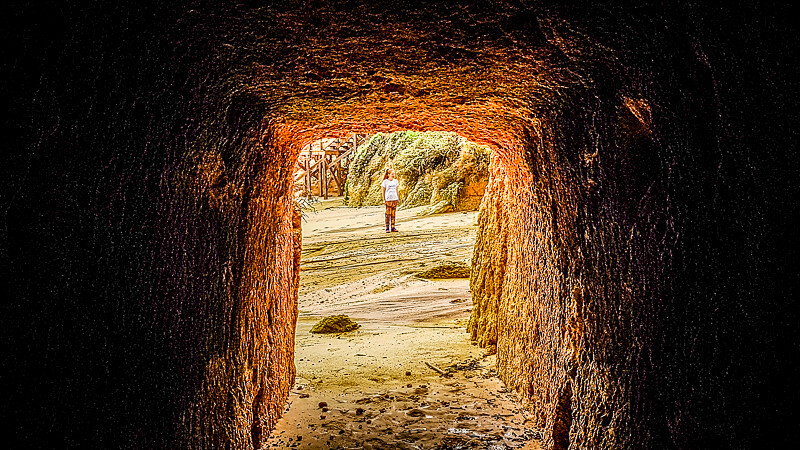 As Mark was close behind her disaster was averted until they went to walk through the tunnel to the other beach…in two steps she was knee deep in it. Both shoes, pants and her top were a mess. This then gave her the opportunity to have a very brief swim to clean herself at the beach before the climb up the stairs started. 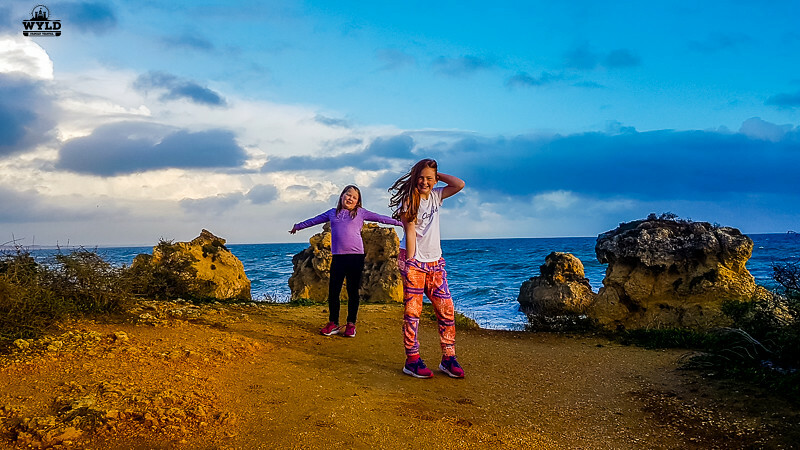 Only Marley could manage this but assured us in was one of the best beaches in the Algarve for kids…and we were there in winter! Do you have any suggestions for the best beaches in the Algarve? These beaches look fantastic! I want to go back to Portugal so I’ll probably stop by these. There was one I wanted to go to but our cab driver said it was touristy so he drove us to a local one which was really chill. Incredible photos! And I am so happy to read this as it is still my dream to travel to the south of Portugal. I have really only heard of Lagos and Farro but had also heard that it can get quite packed with tourists so I appreciate your recommendations. Your photos are really, really nice and capture very nicely the beauty of these beaches. I was in Portugal many years ago but didn’t make it to the Algarves. I can definitely see why so many tourists (and locals) head over there for Summer vacation. Photos are excellent. Gives me a feel of Australia. The place looks quite quiet and peaceful, the way I like it. 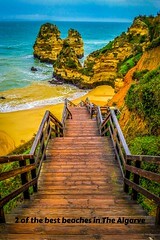 Never been to Portugal so will look upto these beaches when I am there. I love to see beaches that are swimmable but since it is cold nown Europe, then it is not really possible. However, it looks beautiful from the photos and i can feel the breeze of air just by looking at it. These beaches are absolutely gorgeous! I can easily see why they hold a special place in your hearts. The colours are just so bold and vibrant – I practically feel like I am there with you! Incredible photos! They look so vibrant and alive. Thanks for sharing this. Now feeling the need to be near the ocean!! 224 steps! Wow, that is a work out! But the views seemed totally worth it. Both beaches looked beautiful! And I loved the pictures of the girls- all smiles! 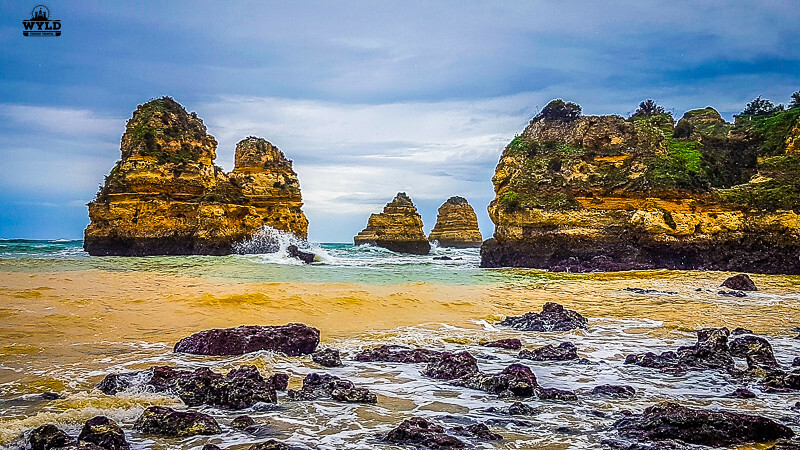 Reminds me of the apostles in the Great Ocean Road in Australia but yes this will be one of my best beaches. 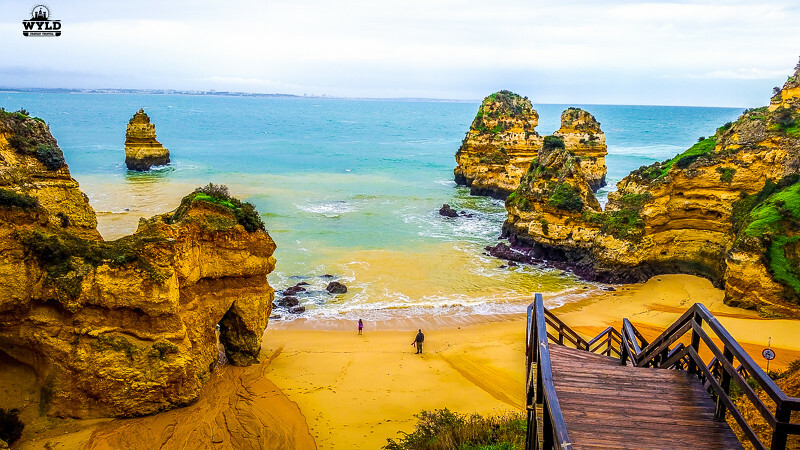 Such stunning beaches – I would love to get to Portugal in general, but the Algarve region looks and sounds absolutely stunning. I dare say this might rival some of our beaches here in Aus! Each time I see a Algarve post I regret having missed it. The beaches you showed are indeed worth visiting and holidaying, hopefully soon.